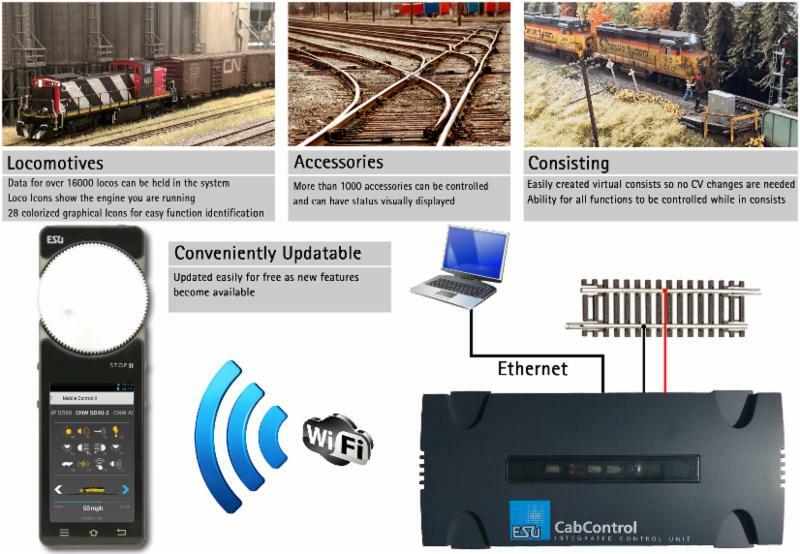 With the 50310 CabControl Integrated Control Unit, advanced model railroading is as simple as ever. With our new system, you have full control over your locomotives, switches and signals just at the tap of a finger. The unit communicates with our Mobile Control II Wireless Controller via wireless LAN. The CabControl's integrated 7 Amp booster also allows it to power even larger layouts with ease. LokSound decoders equipped with RailComPlus® even register automatically with the system! Running trains has finally caught up with the technology of today! * Wireless walk around system making it easy to follow your train on a large layout. * The Cab Control features a LAN port to connect the box to your home network. * Via the home network, the CabControl can be connected to Model RailRoad Control Software. * For easy connection with our ESU boosters, CabControl supports ECoSlink, a high speed, CAN based bus system. The CabControl built-in booster has so much power that, in most cases, you don't need additional ones. Hook up is simple with the CabControl system. All you have to do is plug the 7 A* power supply into the Cab Control box and then hook up your CabControl box to your track for track power and its ready to go! The wireless controllers automatically connect to the system via WLAN. Each CabControl system meets the relevant requirements regarding safety and operation on a layout: The track outlet is protected against overload as well as short circuits. Each CabControl system can differentiate between a "genuine" short, and a momentary current drain when passing over switches or gaps. We place value on the indestructibility of the device, just like we do with our mobile decoders. When you hold your CabControl Throttle in your hands for the first time you will immediately notice its excellent ergonomics. All Parts of the screen can easily be reached with one hand, and unlike a cell phone throttle, the most important functions can even be reached "without looking" giving you the ability to watch your trains and not needing to watch your throttle. This is due to the central, motorized throttle knob with end stop. With this knob you can delicately control the speed of your trains and change direction. For activating functions simply touch the icons on the display. The display also serves for changing functions - exactly the same way as you know it from your mobile phone. Finally, two buttons each on either side serve for changing direction or triggering the most important functions. These side buttons are user editable giving you the choice of what you want to control with them. Providing even more support to our partners in the Industry, All locomotives currently on the market back to 2010 with and ESU LokSound Select or LokSound V4.0 will be automatically recognized by the CabControl system! Finally you'll be able to utilize ESU Decoder features that have been there all along! Over 1000 accessories can also be accessed by the CabControl throttle. Integration of other ESU accessories like SwitchPilots are recommended as the built-in RailCom will add to the enjoyment. The CabControl Throttles are based on the Android operating system. We have created a powerful basis for this open, globally used operating system: The ARM® Cortex® A8 microprocessor clocked with 1.3 GHz and controls a high resolution 3.2 inch TFT color display. A capacitive touch screen assures touch-free data entry. For communicating with the "outside world" there is an USB port and a WLAN interface. Thanks to the standardized radio control interface, trouble free operation of your layout can be assured at any time. The range can be extended with WLAN repeaters, if necessary.